Perspective view of crater with water ice - looking east. 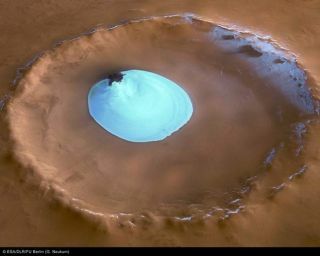 The European Space Agency's (ESA) Mars Express has snapped an image of a modest ice lake on the Red Planet. The frozen patch of water ice is tucked away in an unnamed impact crater. The feature is located on Vastitas Borealis, a broad plain that covers much of the far northern latitudes. The crater is 22 miles (35 kilometers) wide and has a maximum depth of roughly 1.2 miles (2 kilometers) beneath the crater rim. The ice patch is present all year round, as the temperature and pressure are not high enough to allow the frozen water to escape into the atmosphere. The poles on Mars are known to contain large quantities of water ice. At the south pole, the water ice is covered by carbon dioxide ice, commonly called dry ice. There is also ample water ice beneath the surface of Mars. But it is not so common to see isolated patches of water ice away from the poles. Faint traces of water ice are also visible along the rim of the crater and on the crater walls, ESA officials said. The absence of ice along the north-west rim and walls may occur because this area receives more sunlight due to the Sun's orientation. A portion of a patch of underlying dunes is visible at one edge of the ice lake. Colors in the High Resolution Stereo Camera (HRSC) image are very close to natural, but the vertical relief is exaggerated three times, officials said. Mars Express reached Mars and swung into orbit on Dec. 25, 2003. Earlier this year, ESA scientists said subsurface ice they detected on Mars could provide habitats for life. But so far, there is no convincing evidence for martian biology.